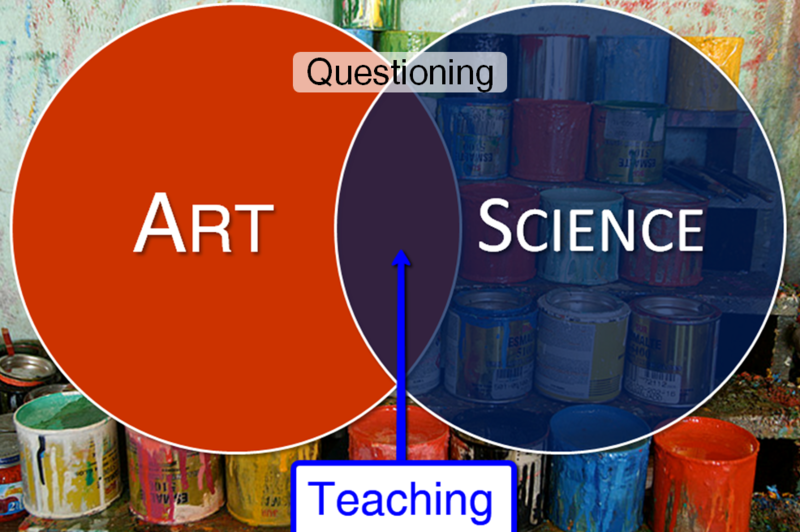 Questioning: Is Teaching a Science or an Art? Recently I recorded and posted a great Google Hangout on our YouTube channel with Jill Ackers of the Dallas Spanish House in which we explored project based learning in her elementary and pre-K Spanish immersion school. One of the things we touched on was how intentional planning can connect content learning and student “play”. As the video excerpt below shows, this took my brain to the intersection of what I call the art and science of teaching. As a believer in leading through questioning, Socratic style, I find this intersection to live very comfortably in the context of inquiry. As Jill describes the process of intentional planning for inquiry it struck me that this, just like all intentional lesson planning and scaffolding, is a true science where research based strategy is leveraged to mazimize student learning. But this planning alone isn’t sufficient, if it were then computers could take it from there, right? Obviously going into a unit or lesson without intentional planning is a recipe for disaster but what great teachers know is that in addition to great planning there is indeed an art to knowing just what question to ask and when. Some teachers come by this more naturally but we all grow through experience and practice as we become more perceptive to knowing just how much productive struggle to allow before our students shift into shutdown mode. I love the evidence of the cycle of inquiry we want to foster for our students as Jill explains the intentional writing of questions connected to content and teaching, then the implementation of those questions in the live classroom setting followed by reflection that would include thinking about the effectiveness of both the content of the questions as well as the timing. This type of craftsmanship of work embodies what we mean with the Artful Thinking in our PBL model and watching a master teacher stretch student thinking is indeed aesthetically pleasing and a true example of rigor. For more on rigor visit Finding the Sweet Spot on the Rigor Curve. This entry was posted in Blog and tagged arts, arts education, inquiry, modeling, pbl, project based learning, science, teaching. Bookmark the permalink.